The official “Last Day of Class” for fall 2012 was Friday, December 14, and the last studio class was the core first year course of Thinking Through Making, led this year by faculty Miriam Schaer and guest faculty Maggie Puckett and Chip Schilling. 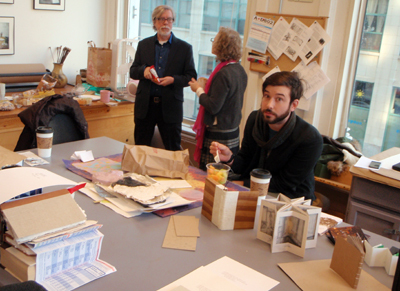 The final six-hour class was devoted to reviews and critiques of all work completed in the three sections of the course: Bookbinging, Papermaking, and Letterpress. Other faculty present for the critique sessions included InterArts department faculty Clif Meador and Melissa Potter, and fellow students from the entire InterArts department were welcome to come and contribute to the process. Although the course is a core requirement for first-year InterArts Book and Paper MFAs, each one of the three sections of the course is open to any InterArts student. This year’s group included Valentina Vella, a second-year InterArts and Media candidate. 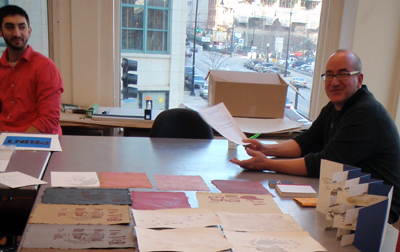 Vella has been expanding her artistic practice to include book arts, and has found handmade paper to be especially critical to her ongoing explorations. After the critique session, students in the course selected works to exhibit in the upcoming winter Galley show at 1104 South Wabash, second floor. The Galley is an exhibition space administered by the InterArts student organization Pulp, Ink, & Thread. The work will be installed over the break by P.I.T. representatives Heather Buechler and Kathi Beste, and open during J-session 2013.